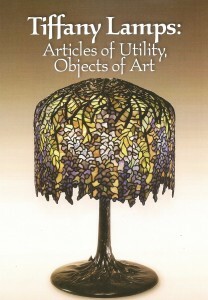 A New Light on Tiffany is a traveling exhibit that highlights the work of Clara Driscoll (1861-1944), head of the women’s glass cutting department, who discovered a way to incorporate stained glass into lamps. Louis Comfort Tiffany (1848-1933) was the son of Charles Tiffany, founder of the Tiffany & Co. jewelery company. 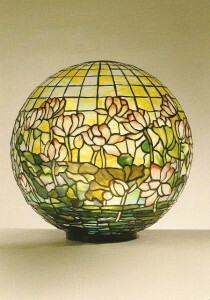 Louis Tiffany’s artistic inspiration often came from nature, and the lily pads in his Oyster Bay, Long Island pond inspired the pond lily globe lamp, c. 1906. The exhibit will be at the Albuquerque Museum of Art and History, May 8, 2011 – August 21, 2011. For more information and future dates, see the New York Historical Society.